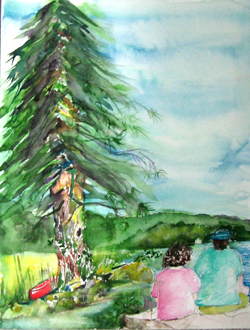 Prior to our visit to Belgrade Lakes, Maine, I had done some homework pertaining to one of Maine's best kept secrets and it was quite a revelation when I discovered that for many years well-known artists and writers had vacationed at this popular lakeside community including one of America's most prominent playwrights, Eugene O'Neill. O'Neill spent the summer of 1926 at Belgrade Lakes, Maine, where he created his Pulitzer Prize play Strange Interlude and it was here where he met for the second time the famous actress Carlotta Monterey who was to become his third wife. Today, Belgrade Lakes hasn't lost any of its allure and you can still enjoy all of the activities and more that early visitors experienced. Moreover, if you are searching for a rustic charmer that is one of those unique romantic places that seems to naturally co-exist with its surroundings then look no further than Wings Hill Inn & Restaurant owned by innkeepers Chris and Tracey Anderson. Although, you won't find here all the appointments that some urban resorts offer, you will nonetheless be able to commune with mother-nature and bask in the simple delights of serenity, relaxation, sounds of loons and waterfalls, and a spectacular view of the sun setting on Long Pond. The Andersons indicated to me that it is important to them that the inn be welcoming and relaxing. They had visited beautiful elegant inns that made them feel a bit nervous to touch the furnishings, and that was the last thing they wanted, especially in such as pretty, natural setting as Belgrade Lakes. The historic roots of the property that house the inn dates back to around 1800 and until 1988, it was a private home. Present owners, Chris and Tracey Anderson purchased the inn in 2000, after working several years as innkeepers in Ogunquit, Maine. Chris candidly indicated to me that the property was not high up on their list when they first set out to start out on their own. In fact, as she exclaimed, it's in the middle of nowhere! In October of 2000, when the foliage was at its spectacular best, the Andersons drove up to the inn and they were in awe by the lake to their left, and the inn, with its rolling, tree-line lawn and 100 foot wrap-around porch on their right. They immediately knew this was home and it certainly resulted in the right fit. The architecture of the inn is a restored circa 1800 post and beam farmhouse, carriage house and stable. The section comprising the farmhouse has a one hundred foot wrap-around, screened porch where, and as weather permits, a three-course breakfast is served as well as the evening feast. Each of the inn's six rooms is tastefully decorated in muted, natural tones with a great deal of taupe and soft, pale greens and roses. All rooms come with private baths. The common room, known as the great room, has an open hearth and fieldstone fireplace with oversized and overstuffed, comfortable furniture. It is here where you will find candy dishes, games and puzzles, paperbacks, snacks and beverages. What is unique about this young husband and wife team is that not only did they have extensive experience as innkeepers before committing themselves to own their own property, but they are also talented chefs as they both graduated of the prestigious Culinary Institute of America in Hyde Park, NY, where they first met, and as they mentioned to me, their relationship developed at first bite. 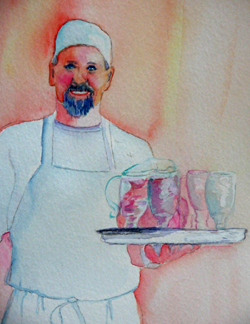 Chris's culinary skills are exemplified in the five-course superb candlelight dinners offered to their inn guests as well as to outsiders that are served inside the inn's three dinning areas or on the wrap-around screened porch overlooking the beautiful lawn where you can also view the sun set over the water. His superb cooking abilities and creative dishes bring out the best in his ingredients. Technically, the inn is located in Rome and as this tiny village is dry the inn is not permitted to serve alcohol. However, guests are welcome to bring their own wine and wine-glasses and corkage are supplied without charge. Tracey involves herself with the three-course complimentary breakfast that is served every morning consisting of a beverage, fruit and a hot entrée-either an omelet with all of the trimmings or your choice of hot and cold cereals. Guests are even greeted with a welcome menu that indicates who are the new arrivals and who will be bidding their farewells. In the afternoon, there is delicious tea and cookies served in the great room. Although civilization seems far away, the inn is an excellent base to explore historic Augusta, Maine's capital city that is only a twenty-five minute drive away. Also nearby is the National Historic District of downtown Hallowell on the banks of the Kennebec River. The ski hills of Sugarloaf Mountain are about an hour away. As for romance, there are several choice spots to enjoy a wonderful romantic picnic such as on Blueberry Hill directly across the lake from the inn that overlooks the village and lakes. There is also the summit of The Mountain featuring trails that view the lakes on both sides. Another great romantic pastime is kayaking on Great Pond, especially during the morning hours or on Long Pond at sunset. The Andersons have indicated that they do host small weddings of up to twenty guests and their grounds are just perfect for an intimate exchanging of vows.